Thank you for all of your kind words last week. I *think* I'm back in the blogging game. We shall see. Can you guys believe it is the last day of April? I mean, what the wha?? It has been a busy month, but I feel like we are prepping for an even busier summer. We are planning a little trip to NYC this summer (it will be the first time I've ever been!) so if you have any recommendations, let me know. I am also planning lots of little weekend trips, which I am so excited about. Isn't summer the best? I know, I really should be focusing on spring right now, but I work at a university, and the students leave in about a week, so summer is pretty much here. And the weather, I mean, it's so Oklahoma-y (cold, hot, cold, hot and always windy). But this Sunday we have a forecast of 91 degrees! Tell me that's not summer weather. I mean, I'm practically laying out at the pool right now. I have this dress and love it too! So pretty! I am wearing the same color cardi today. Glad you decided to stay :). I hope I can make it to NYC someday as well. I have friends and family there. Happy hump day! Love this outfit!! And now I want to clean my Hunters, because yours look a million times better! Haha. Sounds like you'll have an exciting summer a head of you! I'm a little biased to NY since that's where my honey is from, but for a first trip of course you'll want to stop in TImes Square for a few pics, but def don't get stuck there. The city is huge, and there is tons to do in different areas. The metro is pretty easy to use and very convenient so don't be intimidated to use it. I recommend paying a visit to Coney Island for a hot dog at Nathan's and to get on the Ferris wheel or Cyclone if you're more adventurous? the Brooklyn Botanic Garden (usually free and good for pictures), and Good Enough to Eat restaurant (one of Rachel Ray's favorites!...there are also a ton of cute shops and other restaurants on the same street and area, I wish I had more time to explore that area!). Central Park. Soho is good for shopping. Tons of museums, but consider wait times especially if you're there on a weekend. I have a few posts on some places to visit, but I don't want to spam you lol. I've been to so many places there I've honestly lost track, but this may be a good place to start. Let me know if you have any questions, and good luck! and I hope to hear about your adventures! I love your dress and your boots! I keep debating a pair of rain boots, but I can never convince myself I'll wear them enough. (Except this week would be perfect, because we have had/are going to have rain every day this week...) I hope you have fun in New York! I've never been, so can't give you ideas, but I've always wanted to go! What a gorgeous dress! I love the blush color and print on it! And it's really cute how you dressed it down with rain boots and a cardigan! What a pretty dress! I'm hoping the weather here can just break 60 degrees and stay there. It's been cold and rainy mostly lately, it definitely doesn't feel like almost May! At NYC I would say that most of the known touristy things are worth visiting. You also don't want to miss the 9/11 memorial. Oklahoma weather sounds suspiciously similar to Kansas and Nebraska weather! Spring is so bipolar! I was on vacation last week, and apparently it was really warm and sunny in Nebraska. Then we get home, and it's rainy/windy and 40 degrees. Not awesome! It's supposed to get hot this weekend, and I hope it stays that way! Such a pretty dress! Love how you styled it with the long cardigan and rain boots! I've only been to NY a few times for work and there was not much time to do anything fun and touristy. I'll be excited to read about your trip later this summer! So glad to see you back and looking fabulous! And it is your blog--if you wanna post everyday, once a week, hell--once a month--then that's what you should do! You will still have all of us that support you read it whenever you decide to post :) Ps. LOVE the floral dress soo much! Great dress! I love it with the Hunter boots! hard to believe we're already past the first quarter of the year! we've been having so much rain, and i forgot to pull out my hunters...gah!! Adorable! 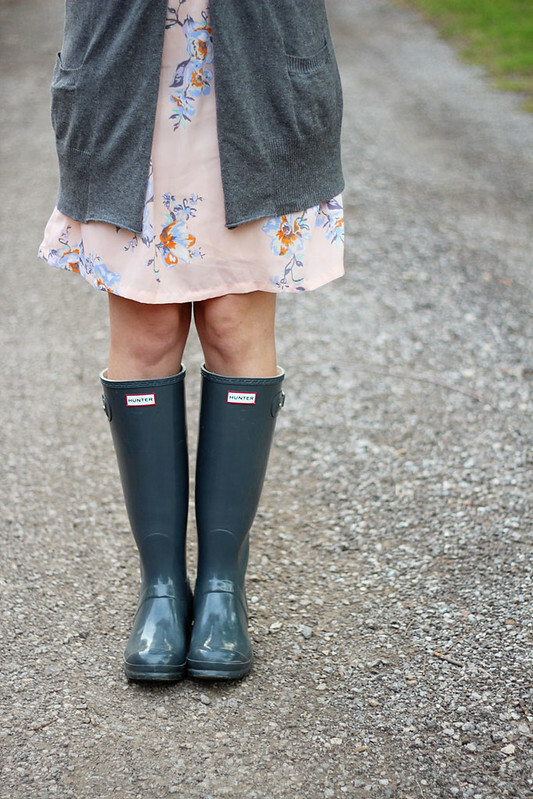 Love the cute dress and the rain boots!! CUTE! You've inspired my outfit for tomorrow. It's another forecast that calls for rain, and I've been wearing pants all week and I'm bored of it. The dress and long cardigan with the Hunter's looks so cute! Ps - I WISH it was 91 here. It's still like, 50ish and rain and I'm like....just no. I love the color of your hunter boots. So pretty. And the boots with the floral dress is just divine. We have not had hardly any rain here in California. This makes me so sad! Love the dress! I am not big on floral but that one I could totally handle! love the dress and the boots are keepers !! 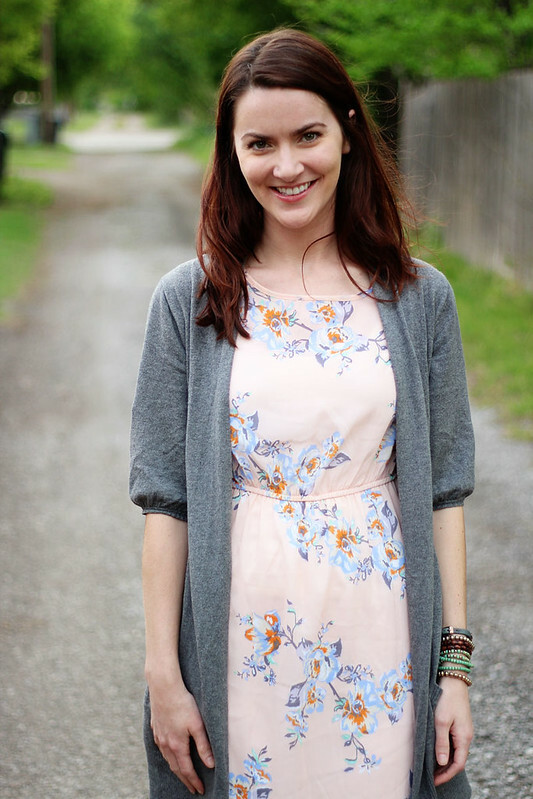 Your blog is so lovely, and I adore everything about this outfit. 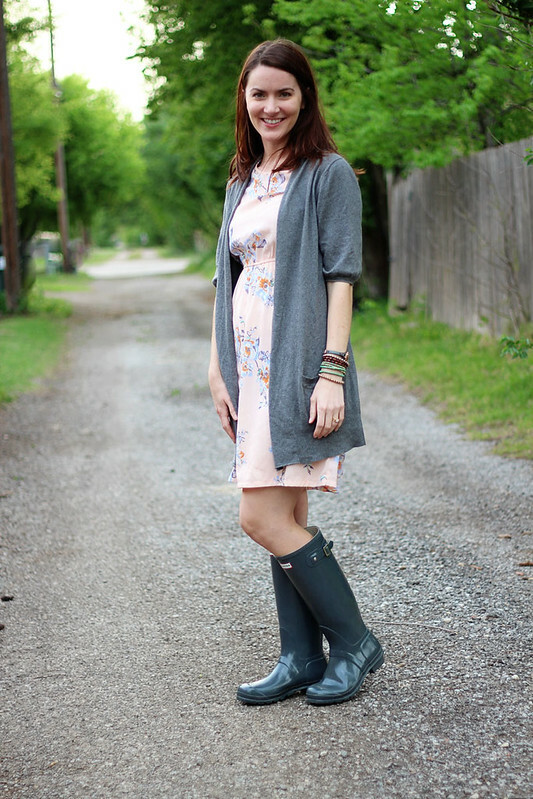 Rainboots, floral, long gray sweater (love the sleeves) - the perfect mix between casual and elegant. A very cute and chill layered outfit. And I want some of that sun, NOW! glad you're back in the game! you look adorable as always - I seriously need to get some hunters - loving this dress! nyc is ah-mazing but I've never been as an adult so I have zero helpful hints for you. Enjoy the heat this weekend - maybe have a cocktail by the pool for me? Pretty!! I love the dainty colors of this floral! LOVE the boots with this dress! You look adorable! This is so pretty! It looks amazing with these boots too! I love this! It is seriously the most perfect rainy day outfit, I like the colors and proportions and everything! I am planning as many weekend getaways as I can this summer, something about the season just makes me want to road-trip to everywhere.